I am using a Bluetooth 3.0/aptX Audio Device. Pairing the device leads to choppy audio, due to bad default bitpool settings in OSX. The issue has been widely documented, e.g. here on stackexchange. Writing new settings to com.apple.BluetoothAudioAgent does not affect the actual bitpool settings on Mavericks. These settings are not persisted across reboots though. 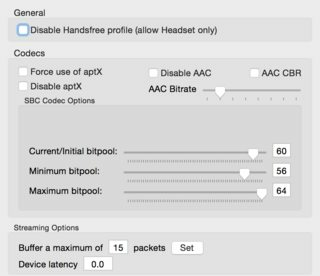 How can I persist the desired Bluetooth Audio Bitpool settings across reboots on Mavericks? This will modify your boot kernel arguments. Not the answer you're looking for? Browse other questions tagged mavericks audio bluetooth .